Topographic maps worldwide often appear utilitarian, if not a little boring graphically. By comparison the new 260s were stylish and modern without losing any utility. They were undoubtedly among the best looking topographic maps in the world. 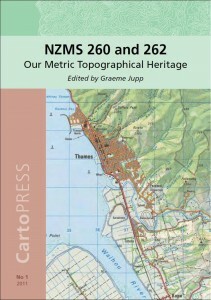 This is a review of Graeme Jupp’s recently published booklet, titled “NZMS 260 and 262: Our Metric Topographical Heritage”, which was published in February 2011 as part of the CartoPRESS series by the New Zealand Cartographic Society. I’m not giving a complete qualified review, because I’m neither a cartographer nor am I very familiar with much of the history the material to comment on accuracy. It’s more of a perspective from someone who’s enjoyed using New Zealand’s topo maps over the last few years from a tramping perspective. If anyone notices mistakes in some of my comments to do with mapping history or technical issues, please feel welcome to correct me in the comments below. An alternative review by Shaun Barnett has been published in FMC Bulletin 184 from June 2011 (see here for a download link), which has been republished by the NZ Cartographic Society. If you’ve spent any of the last several decades using New Zealand’s official topo maps to plan interesting trips, you might find a moment to turn an eye to a short collation of recent cartographic history. This book combines a history with a comprehensive tabular appendix of maps. The combination of the history and the tables means it will make a handy reference item to have on the shelf for many people with an interest. The 260 and 262 map series are now obsolete, having respectively been replaced by the Topo50 and Topo250 series as of September 2009, but until that time they became extremely popular, and many are still in circulation today. As concluded by the editor, more than 2.8 million maps of the 260 series, and a further 408,000 maps in the 262 series (which shared the same geodetic datum but was drawn to a different scale) were printed between 1978 and 2009. Production of the 260 and 262 series provided a platform, and also established techniques and technologies upon which New Zealand’s topographic map-making continues to be built. The influence of this period of time in the production of maps in New Zealand seems hard to argue with. The book is an attempt, generally successful as far as I’m concerned, to compile a history of the production of the first sets of metric maps to cover all of New Zealand, and also to document every batch of maps produced. The title of the book suggests that it’s about the NZMS 260 and 262 series of maps. This is correct, but it might also be true to say that it’s a history of the map projection and map grid which these two series of maps shared. The projection was designed for these maps during the early 1970s, and it was made obsolete by the replacement projection for the Topo50 and Topo250 maps which are now in use. 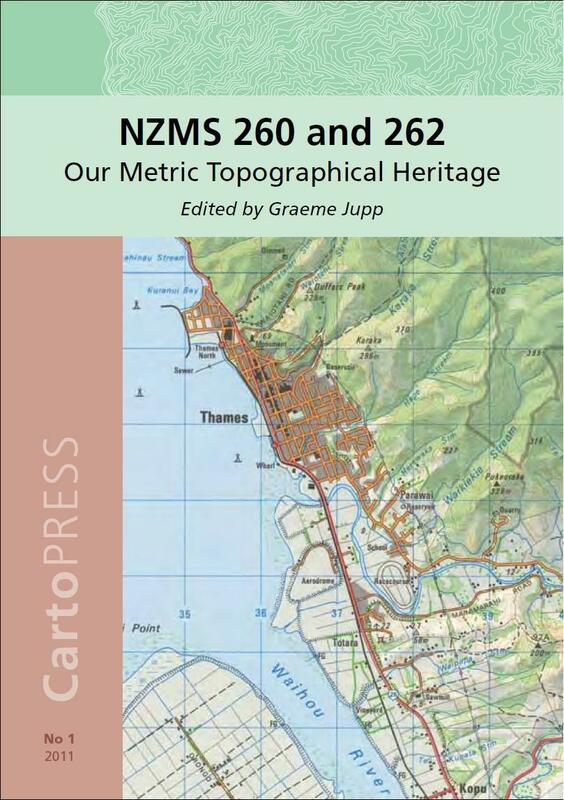 At the time of writing this review, it can be ordered via the NZ Cartographic Society’s website for $25 plus postage. Being in a niche of cartographers and those in the industry, only 150 copies have been printed, but there’s plenty in the book to interest casual map users who just want to learn more about what happens behind the scenes. Looking at my own copy the layout is clean, the printing is excellent, the binding is tidy, and it’s a very handy light-weight academic journal style of booklet to carry around. From an editing perspective I didn’t experience any distracting spelling or grammar errors. Less than half the content (pages 1 to 42) is text. This text is composed of several articles, each covering a different topic relating to production of the NZMS 260 and NZMS 262 series. Two of the articles are written by the editor, and the rest have been written by various authors. The remainder of the book (pages 43 to 95) is composed of a tabular list that details all maps produced. The tables have been compiled from a variety of official and unofficial sources, but now provide a definitive list of every printing of every edition of every map in the NZMS 260 and NZMS 262 series, complete with any relevant notes and descriptions of milestones achieved by particular maps, revisions or printings. The history articles in the first part of the book are interesting enough. For the tables alone, however, it’s a very useful reference book to have on the shelf. New Zealand adopted the metric system in 1969, which was a trigger to do away with the earlier NZMS 1 series of official topo maps, scaled at an “inch to the mile”, or 1:63 360 and giving elevations in feet rather than metres. A new series, starting from scratch, could be an excellent opportunity to revise how things were done. Besides being drawn at an inconvenient scale, NZMS 1 had evolved from the earliest maps that were created soon after wartime years, when foreign invasion had been a prime concern. Different maps in the series had inconsistent symbols and features, and some maps didn’t even match along the edges. When the metric system was adopted, however, NZMS 1 was still incomplete with large sections of Fiordland still having no maps at all. For this reason, following much debate, a decision was made to complete the NZMS 1 series whilst meanwhile, in the background, the replacement series would be designed. The new series, with its metric scale, would require a new projection to project a curved surface of the Earth onto flat pages, and this would have been a mathematical challenge in itself. The result was a projection to go with a 1:50 000 scale series of maps, where 1 kilometer would be represented by 2 centimetres. Furthermore, the newly designed projection could now be applied to both main islands of the country compared with NZMS 1 which had needed a separate projection for each island. The design and look of the maps was debated over several years, but ultimately the opportunity of a new series meant that symbols, layout and printing could be clearly standardised from the beginning, with standards being built on everything that had been learned from the past several decades. These standards were then consistently adhered to for a period of more than 30 years of map production, despite some significant changes behind the scenes in government restructuring, technology and procedures. From the late 1970s, a 1:250 000 scale series (NZMS 262) was created based on the same map projection, largely using data originally compiled for the NZMS 260 maps. From my own mostly-tramping perspective, I found much of the content both interesting and informative. I hadn’t realised the Bill Drake, who oversaw production of the maps from 1970 to 1992, was also an experienced mountaineer and tramper, and that this strongly influenced the revised designs so as to make them more useful outdoors in the field. In his re-printed article from 1983, he explains how the proposed designs of the maps needed to be tested in the field, and intelligently take into account the most useful presentations for some very different kinds of terrain, such as mountainous back-country versus rural plains or densely built cities. Prior to this book, it hadn’t occurred to me just how much thought has to go into seemingly tiny details that aren’t typically noticed by a user, some of which can’t even be seen except with close examination, to make a map useful. The editor directly contributes two articles, respectively about the 260 series and the 262 series, written from his cartographer’s perspective since becoming involved in 1990. He includes much specific detail about particular challenges and changes during production. Issues such as oversized sheets and wasted space, the introduction of dual naming, the experimental printing of maps S25 and S26 (covering the Tararuas) onto double-sided high wet-strength ‘tyvec’ paper in 1984, and the delays in producing sheet H36 which was in progress during the rock-slide that shortened the height of Aoraki Mt Cook during the early 1990s. Between his two articles, he refers to the commissioning and execution of a fully digital 1:250 000 database in 1989, which “laid the foundation” for the digitised 1:50 000 database in the mid 1990s, which has since evolved to produce the most recent Topo50 maps. A perspective on the printing of the maps is given in a shorter article by David Balm. He discusses the processes and challenges involved with getting the colours and alignment, and how the re-think of maps allowed them to take advantage of new printing technologies. Craig Gear then expands on issues that arose with choosing and sourcing paper, and printing standards that were put in place to let the process be streamlined. I won’t criticise this book in any serious way. Partly because I don’t think I’m qualified, but also because I couldn’t see much to complain about. I think any of my criticism is more to do with a mis-match of my expectations than with shortcomings in the book. With the right expectations, it’s a great book. Datums and digital databases: Something that stood out to me, as a layperson who’s spent a little time trying to learn about geodetic datums and digital mapping technology, is that the compilation did not include much discussion around either the changes in map grids and geodetic datums, or the introduction of digital technology. Whilst the rest of the book contains extensive material and documentation of presentation information, design and shadings, and printing issues, only a few short paragraphs mention these two topics which must have their own significant place in the production, maintenance and eventual demise of these maps. When these topics are referenced, it’s essentially to say that “it needed to be done”, or “was done”, and that “someone else did it”. In retrospect, I now wonder if the content might have benefited from a couple of additional articles written on the topic of designing map projections, and on digitising the geographic information, and expressing how these topics applied to the NZMS 260 and NZMS 262 map series. The end of lifetime: Extending from these topics, the book included little discussion about the end of the lifetime of the maps. At least as I understand it (again as a layperson), the datum and projection, and compatibility issues with various international technology, was a significant reason for Land Information New Zealand to drop the series. Thus we now have the Topo50 and Topo250 maps produced today, which are based upon a different geodetic datum and with a different map grid. In reading this book, it should be understood by the reader that it’s foremost a compilation about the reasons for and production of the maps of that period between about 1970 and the turn of the century. It’s less of an explanation of why those maps were eventually replaced. Less attention to the NZMS 262 series: I suggested earlier that this book is as much a history of the map projection—or at least the time period in which it was used—as it is of the two major series of maps that used that projection. With this in mind, I felt there was a lesser amount of discussion about the 262 series than was implied by the title. My initial expectation from the book’s title was that both series would be treated roughly evenly, but my impression was that the 262 series had been described almost as an afterthought to make the book more complete. Most of the articles refer primarily to the 1:50 000 260 series, with the 1:250 000 262 series being allowed about 4 pages of text authored by the editor, after removing several graphics (compared with about 22 complete pages of text in total). I think this “afterthought” impression really was a consequence of my expectation of equality from the book’s title. The heavier content on the more popular map series is almost certainly because the 260 series seems to be where most of the action and major decisions happened, whilst the 262 series was a less visible derivative that probably didn’t have anywhere near as much history to document. Ultimately, the history of the two series are tied together. In Order to Make a Good Impression. This entry was posted in reviews and tagged book, land information new zealand, maps, musing, review. Bookmark the permalink.